Doublet exclusion as the name suggests, is to ensure you count single cells and exclude doublets from your analysis. This can be critical in cell sorting, cell cycle and DNA analysis. If a doublet containing a fluorescence positive and negative cell passes through the laser (Figure 26), it will produce a positive pulse leading to false positives in both analysis and sorting experiments. Fig. 26. Schematic of processing of doublets. Doublet exclusion is performed by plotting the height or width against the area for forward scatter or side scatter (Figure 27). Doublets will have double the area and width values of single cells whilst the height is roughly the same. Therefore disproportions between height, width and area can be used to identify doublets. Fig. 27. Doublet discrimination. 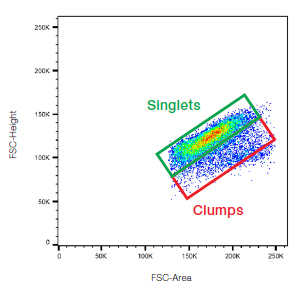 Doublets (red) can be distinguished from single cells (green) by plotting FSC height vs FCS area. Doublets have increased area whilst similar height to single cells. Removal of doublets is also crucial in cell cycle analysis. It is important to distinguish between single cells that have double the amount of DNA and doublets as they will both show increased fluorescence when stained with a DNA dye such as propidium iodide. Fortunately using the height or width vs area allows you to separate the doublets from the single cells containing 4n amounts of DNA. Cells containing 4n amounts of DNA have double the area and height values whilst the width is roughly the same as cells containing 2n amounts of DNA.